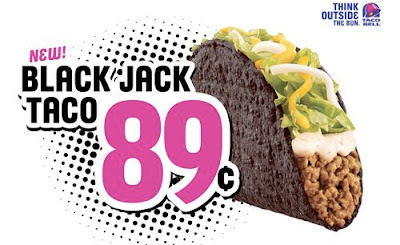 If you haven't seen the commercials yet, Taco Bell is offering a FREE black Jack Taco on Halloween from 6pm to midnight. So, I decided to get one tonight to see what it tasted like. Actually it was pretty good for a Taco Bell taco. I think it's the zesty sauce that pretty much makes it. So if you have a car load of tired trick or treaters on Saturday night and want to feed them for cheap, you'll know where to go!